S. Charmaine McKissick-Melton is associate professor and former interim chair in the Department of Mass Communication at North Carolina Central University, and a 2017–18 NCCU-Duke Digital Humanities Fellow. She was previously at Bennett College in Greensboro, North Carolina. In 1992, she was awarded the Coca-Cola Minority Faculty Fellowship at the University of Notre Dame, where she taught a course titled "The Civil Rights Movement and Beyond." McKissick-Melton received the Board of Governor's Teaching Excellence Award in May 2017. 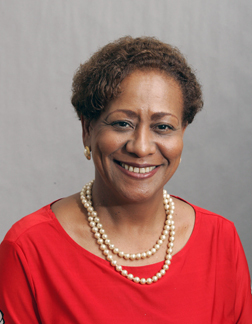 She also received the NCCU Teaching Excellence Award in May 2011. She received her B.A. in radio, television, and film from the University of North Carolina–Chapel Hill (1977) and a master’s in speech communication with a specialization in radio, television, and film from Northern Illinois University (1978). She worked in the communications industry for ten years, in radio and television sales and management. From 1993 to 1996 she was a Lyman T. Johnson Research Teaching Fellow at the University of Kentucky, where she received her Ph.D. in communications with a focus on race relations. McKissick-Melton is a frequent public speaker on her experiences growing up during the civil rights movement. The youngest of the late Jude Floyd B. McKissick Sr.’s four children, she speaks from personal perceptions of civil rights, weaving in black empowerment, positive self-esteem, and the role of the media in political development. Her two older sisters integrated the North Carolina school system, and she watched the abusive actions they encountered daily. She and her brother were also intimately involved in the integration of southern elementary schools. She accompanied her father and family through integration, the Meredith March in Mississippi in 1966, and the Harlem riots after Martin Luther King’s death. She has shared home and meals with many in the movement, including Martin Luther King Jr., Jesse Jackson, Malcolm X, Stokely Carmichael, Ralph Abernathy, James Farmer, Adam Clayton Powell Jr., and Harvey Gantt. The mother of two African American males (Maceo and Daniel Kemp), she has a vested interest in where this past will take us in the future. She is married to Tyrone Melton, a UniServ Director for the North Carolina Association of Educators. They work together on a variety of projects to promote human and social justice. McKissick-Melton has been active on the board of directors of many community, business, and political and social awareness organizations. Currently she is working on preparing the memoirs of her father and on two narrative collection projects.